Kedleston Hall is a grand and majestic 18th century mansion set within beautiful rolling parkland. 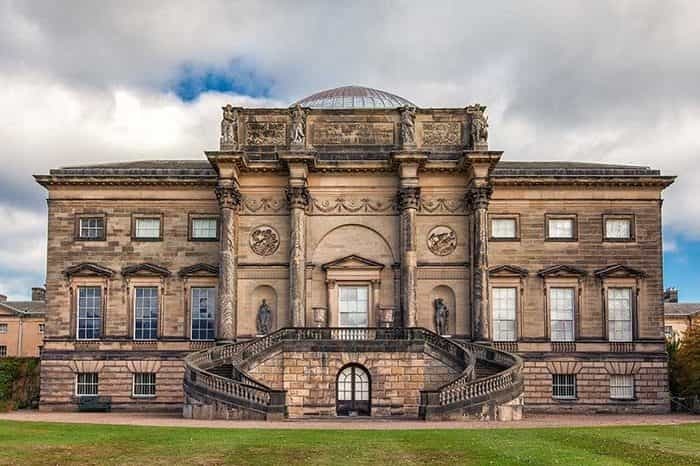 Built not as a family home, but as a lavish setting for entertaining, it’s no surprise that Kedleston has been the backdrop to many a Hollywood blockbuster. 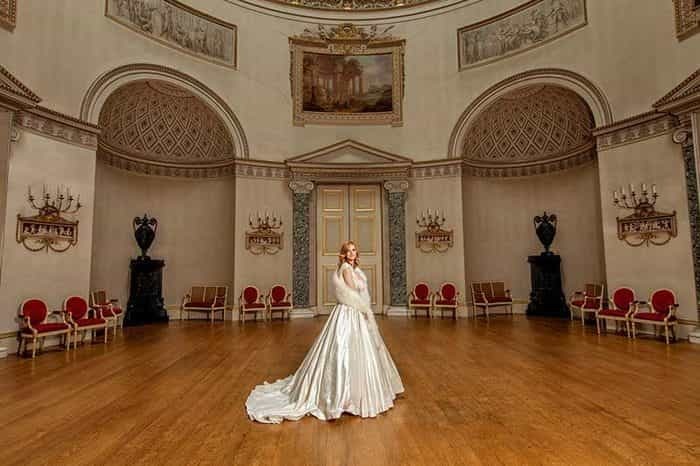 When you hold your wedding celebrations with us at Kedleston Hall, you and your special guests can feel like royalty for the day. The spectacular interiors, designed by architect Robert Adam, boast incredible marble floorings and towering stone pillars, as well as regal paintings and gilded furniture. The romantic curved staircases at both the front and rear of the property provide the perfect location for photographs, as well as Adam’s bridge which crosses the river with views of the hall. Your guests can enjoy a warm welcome through the breath taking Marble Hall on arrival, before taking their seats for a civil ceremony or civil partnership in the curved saloon with its impressive domed ceiling. Leading out onto the south lawns, your celebrations can continue with a drinks reception before enjoying a wedding breakfast for up to 80 friends and family in Caesars Hall or in the Great Kitchen. We are also pleased to be able to offer you the opportunity to host larger wedding celebrations within a traditional marquee or a unique giant tipi on one of six plots within the grounds. All of the locations have fantastic panoramic views back towards the hall and out across the parkland allowing you to create your dream setting with your preferred view. From small intimate occasions to larger celebrations, Kedleston is a truly magical location for the most important day of your life. Our couples can enjoy the luxury of a dedicated Honeysuckle & Castle wedding coordinator who will be on hand to guide you through the planning process and to manage and coordinate on the day itself, ensuring your wedding day is truly memorable for you and your guests. Other Features: Professional Wedding Coordinators exclusively offering three unique wedding venues across the East Midlands. Calke Abbey Derbyshire. Kedleston Hall, Derbyshire. Hardwick Hall, Derbyshire. Clumber Park, Nottinghamshire.